Do I need a floor jack that is light weight and primarily for light duty jobs? 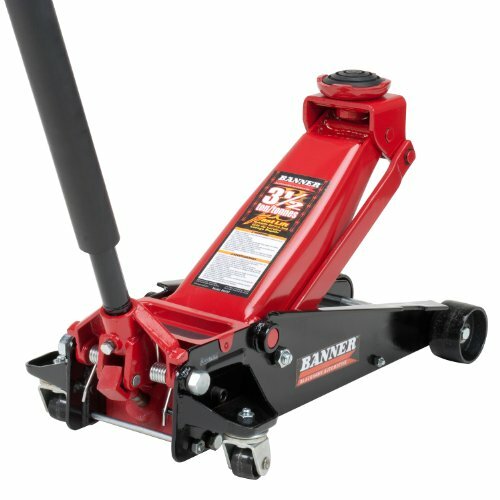 Do I need a floor jack that is bigger and heavier for heavy duty jobs? Should I choose steel or aluminum in a floor jack? 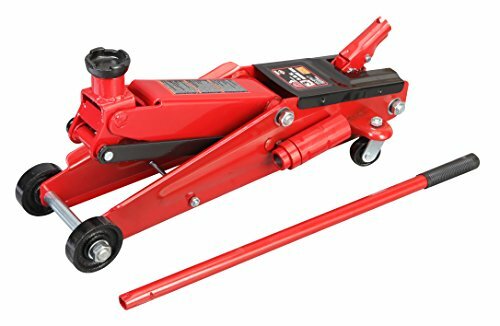 How much am I willing to spend on an automobile floor jack? By answering some of these questions first, you’ll be better prepared when shopping for different types of floor jacks. In most cases you’ll be required to invest a bit of cash for a decent floor jack, but in return it will serve you for years to come. Forget the regular angle jacks you’d find in the trunk of your vehicle. Some of todays best car jacks can lift vehicles **SAFELY** and in a matter of seconds too. What we have going on below is a complete list of floor jack reviews (10 of the best we found), take all of the questions into considerations when picking the one you like. 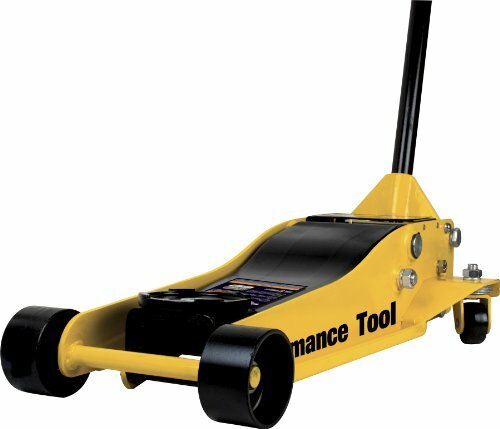 This list of 10 automotive floor jacks is in no particular order, so pick any of these and your satisfaction rate should be golden. NOTE: For regular garage and shop use, there’s 2 ton floor jacks, 3 ton floor jacks, 4 ton floor jacks and 5 ton floor jacks. in 95% of cases, you won’t need to get a jack that supports anything heavier. For the heavy duty jobs where you are required to lift OVER 5,000 lbs, Performance Tool W1627 3.5 Ton Floor Jack may be the answer. It’s a low profile jack made specifically to go under low ground clearance vehicles, you can lift a vehicle up from 4″ all the way up to 20.5″ inches. With hydraulic fluid used to pump the jack up and down, you can use the swivel casters to move it around on flat floors. Because of the weight capacity this floor jack boasts, it weight at around 85 lbs (not light by any means, in some cases two hands may be required). We recommend using this jack for practically any kind of vehicle, anything that is under 7,000 lbs curb weight. 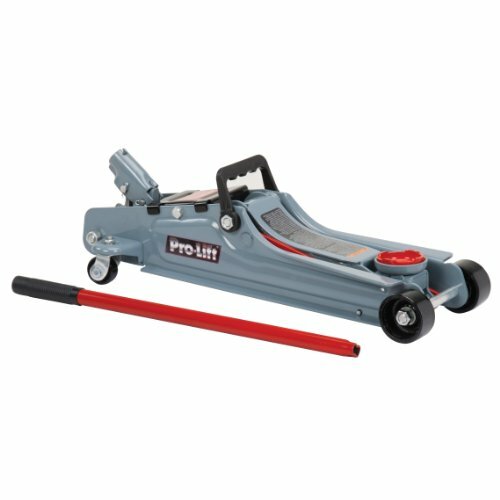 Probably the most common weight capacity of any floor jacks at around 2 tons, the Pro-Lift F767 Low Profile floor jack is the ideal choice of you’ve got a small to medium sized family car. Being low profile makes it easier to slide underneath low ground clearance cars. Although made entirely of steel, it weighs in at around 30 lbs for the whole package. Lifting range for this F-767 series ranges from 3.5″ inches to 14″ inches in height. For vehicles under 4,000 lbs, you’ll find this jack to be perfect. It’s rated at 4,000 lbs max but we recommend using this on a vehicle at no more than 3,500 lbs. You’ll love this floor jack if you’re looking to do light duty jobs like (change tires, brake jobs etc). The cost is also very reasonable at under 70 dollars. Another affordable floor jack on our list, the Torin T83006 3 ton garage floor jack takes our #8 spot. What we love about this right off the bat is the price, as you see most other ones are at least 2x more expensive. 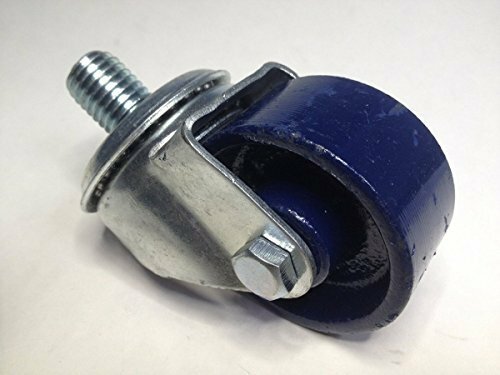 This is an effective jack to work very well on trucks and SUV’s due to the extension adapters which are provided with this unit. Lifting can range from 6″ inches all the way up to 21″ inches when paired with the extension adapter. Weighing in at around 44 lbs for the whole package, it’s a bit heavy to easily maneuver by hand. Also it isn’t easy to move around on concrete. We recommend using this on a very flat surfaced garage floor to make your life easier using this product. Not the most “appealing” floor jack around, but it’s one of the tallest you can get for under 100 dollars. For a heavy duty floor jack that is comfortable to use and relatively affordable, we have the Blackhawk B6350 3.5 ton capacity floor jack. This product is made entirely of steel, which also adds to the overall weight of around 85 lbs (not light at all. Using the casters you’re better off on smooth surfaces. The saddle which you use to lift your vehicle with swivels, making it pretty easy to position on the spot you want to lift. You may require to pump this jack more than some other ones to reach the maximum height. It isn’t for low profile vehicles with ground clearance under 8″ inches but what it will do great in is lifting up medium to large sized cars, trucks and SUV’s. Price is right where it should be. Blackhawk provides you with a one-year warranty from the date of purchase in case there’s a mishap with the floor jack. 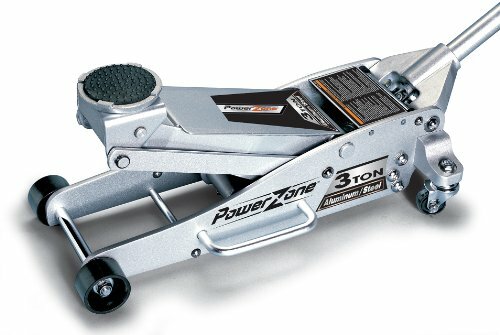 If you want a good looking and heavy duty floor jack that won’t break your bank, consider looking into Powerzone’s 3 Ton Aluminum and Steel Grage Jack. From first glance, you’ll see it’s the type of jack that will fit into any garage. This one is rated at 3 tons or about 6,000 lbs which puts it under the medium to heavy-duty category. You can lift from as low as 4″ inches to as high as 18.25″ inches using the hydraulic system. Comparing it to similar floor jacks with weight in close to 80 lbs, this one with aluminum weighs in at just under 60 lbs (which is impressive for 3-ton capacity). To protect your vehicle’s frame, the saddle is padded with a very durable rubber pad. 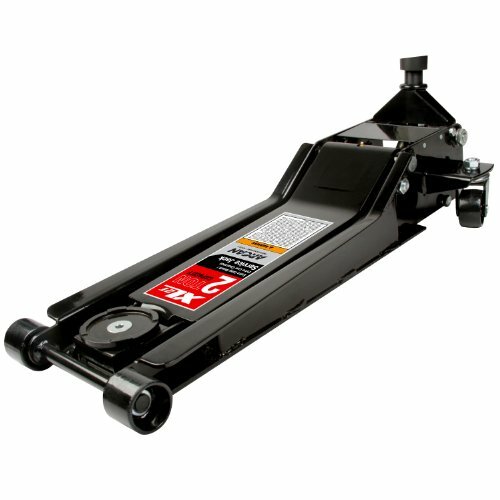 For anything that doesn’t have too low ground clearance, this floor jack is perfect. 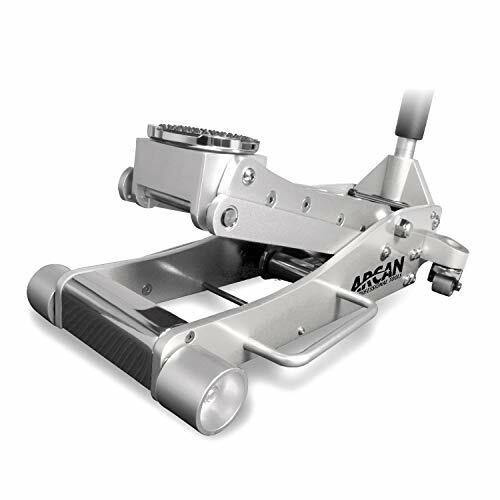 One of the lowest profile car floor jacks we’ve come across, we have Arcan XL2T Low Profile Steel Floor Jack. Very sleek in looks, it slides underneath vehicle with no issues whatsoever. 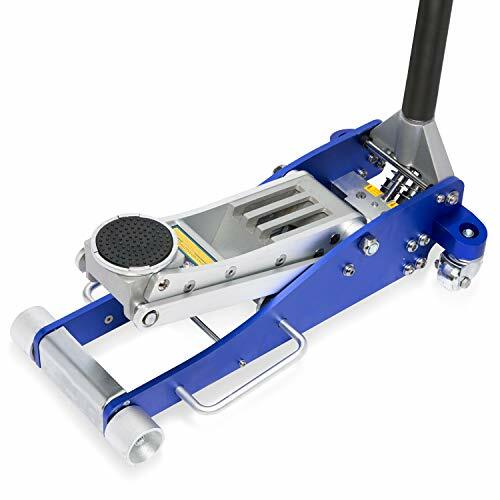 This is probably the best floor jack you can get for low (or lowered) vehicles, height ranging from 2.75″ inches to 24″ inches. With the built-in dual pump, you’re able to lift 2x faster. A drawback with this floor lift is the overall weight of nearly 100 lbs. For anything that can make your life easier moving this thing around, it would be a flat surface floor. The chassis is extended to over 2.5 ft (or about 32″ inches). In conclusion with this floor jack, it’s very heavy but easy enough to roll around using the casters. If you have a very low vehicle, this floor jack is definitely worth looking into. Now that we’ve reviewed Arcan’s low profile floor jack above, we’re now going to cover their regular aluminum floor jack. The Arcan ALJ3T Aluminum floor jack is capable of lifting 3 tons (or about 6,000 lbs). It features a reinforced lift arm to add support, as well as chassis torsion control and stability. With the dual pump comes much faster lifting, you can go from as low as 3.6″ inches to as high as 19.4″ inches. In the case you’re ever lifting more than it’s rated for, the bypass and overload valve prevent over-extension of the hydraulic arm (a great added safety feature). Much like Powerzone in looks, this floor jack in particular looks visually stunning and won’t feel out of place. The last important part about this unit is the overall weight of 56 lbs, use the built-in handle to carry it. If you want durability, lightweight, and medium to heavy duty use, it’s worth looking into! For crazy good rigidity and durability, the Hein-Werner HW93642 is one of the best automotive jacks you can get. Made entirely in the United States of America, this unit in particular is by no means light. Weighing in at just under 100 lbs, the lift arm and pump base is made entirely of cast iron. This jack in particular is priced at a premium but that’s primarily due to the build quality of real American employees. When you’re getting ready to lift your vehicle, you’ll be able to get height between 4.5″ inches and 20.25″ inches and weight limit to approximately 4,000 lbs. The last important feature and added benefit you’ll receive, is a wider frame for increased stability (approximately 11.75″ inches wide and about 6.75″ inches high when not jacked up). For a premium cost you’re getting durability for the long term, it’s just that plain and simple. Coming in as #2 for the best floor jack to get is Neiko Pro Low Profile Aluminum Floor Jack. This floor jack is special because it’s meant for heavy duty use but weighs a considerably lower amount than its competition (under 60 lbs). From as low as 3.5″ inches to as high as 19.25″ inches, you can lift up to 6,000 lbs. The low profile design allows it to be slid underneath lower ground clearance vehicles much easier. Like we mentioned above, it’s made of aluminum allow to reduce weight but the structure itself is still very rigged and allows you to lift up to 3 tons. The rubber pad cushion located on the saddle allows you to lift any vehicle without scratching the frame or pinch weld area. Overall, an exceptional floor jack for nearly any garage. After going through numerous floor jacks and seeing exactly what each one has to offer, we decided that JEGS Performance Professional Low-Profile Aluminum Floor Jack is our #1 pick. Yes, there’s so many out there to choose from but this is by far the best one we could find for a reasonable price. First and foremost, let’s dive into the main specs this automotive floor jack has to offer. What sets this jack apart from all the other ones we reviewed above, is the overall weight. By a good margin, this floor jack is the lightest at 49 lbs for the whole package. Although this is primarily due to the all aluminum construction, it’s still capable of lifting up to 2 tons (4,000 lbs). Using the padded pump bar, this lift will raise your vehicle from as little as 3.5″ inches to as much as 19.25″ inches. With the padded saddle, it helps to protect your vehicles paint from getting scratched. Stability is also quite good with an overall wide from wheel to wheel of 13″ inches. Best of the best, JEGS is your answer. EXTRA: With a good quality floor jack requires a high quality set of car ramps. Along with that, consider looking into a nice tool set and a torque wrench for when you’re changing tires (this applies if you haven’t already got those items). WARNING: Do not EVER work on your vehicle using floor jacks alone to hold the vehicle up. Get a solid pair of jack stands to hold the vehicle up and avoid any possibility of DEATH.